It's Monday morning here in the workplace, the most difficult part of the week. ;-) While I am having my morning break, allow me to post something that never fails to make me happy... FOOOOOD! Just to perk me up on the first day of the week, I compiled these tempting pictures and might as well tempt everyone, hahaha! The theme of my collage is sweets. 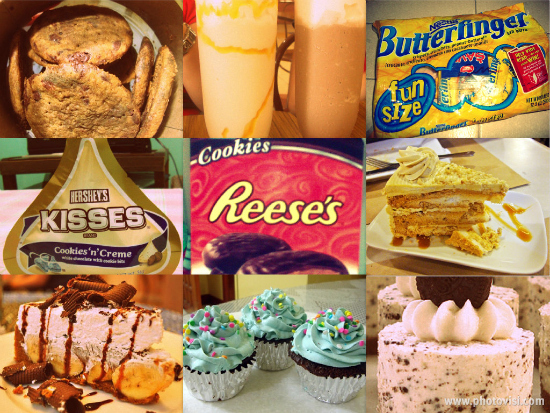 I collaged my favorite sweets and desserts starting of with Double Expresso Cookies, Mocha Frappucino, Butterfinger, Cookies and Cream Kisses, Reese's Cookies, Mocha Sans Rival Cake, Banoffee Pie, Cupcakes with Frosted Icing, and Oreo Cake. P.S. I will be doing another food post next Monday. I hope you can join me too. I am so behind the times... hindi pa ako nakakatikim ng Banoffee pie :-/ I always see a the banner in Banapple but never had the time to stop (, always rushing when I pass by there, no parking and good luck waiting for a cab in that area). Someday, matitikman ko din yan, haha. I'll take two of each! Butterfingers are my weakness. I'll be thinking about these all day. OMG! Our tastes in food are very similar. I love everything in your collage. Yum!!! !